The Ancient Egyptians, both men and women, wore distinct eye make up, rouge and perfumed oils that softened the skin and prevented burning in the sun and damage from the sandy winds. Not only did the men and women of Egypt wear make up but also the statues of their gods and goddesses were adorned with all these different types of cosmetics. The higher the status of the person the more clothes and make-up they wore. The Ancient Egyptian eye make up was extremely elaborate and created the almond eye look which has become synonymous with the Ancient Egyptians. Eye make up had a long history in Ancient Egypt and both men and women were using eye make as early as 4000BC. The eye make they used concentrated in providing color to their eye lashes, eye lids and eye brows. The favorite eye make up colors were black and green. The powders used to create the eye make up were ground on a palette then mixed with water to form a paste. The black coloring of Ancient Egyptian eye make up, favored in the Period of the New Kingdom, was achieved by the use of Kohl. Kohl is a mixture of soot and galena. The Egyptian eye make kohl was stored in richly decorated containers called kohl pots. The green coloring of Ancient Egyptian eye make up was achieved by the use green pigment called malachite. 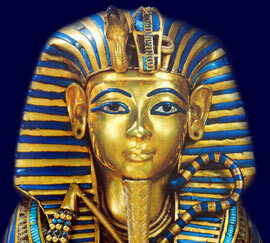 Ancient Egyptians used a type of rouge to stain their lips and cheeks. The red coloring used by Ancient Egyptian in make up was achieved by the use of ochre. Ancient Egyptians used a form of henna to paint their nails and color their hair. The color and condition of nails have long been an indication of social status. The coloring used by Ancient Egyptian in this type make up was achieved by the use of henna. To create the make up and cosmetics using henna the leaves or shoots were ground on a palette then mixed with water to form a paste. Kohl also acted as a deterrent to flies! Traditional reasons - Egyptian mothers would apply kohl to the eyes of infants soon after they were born believing its application would strengthen the child's eyes and preventing the child from being cursed by an "evil eye"
The Ancient Egyptians used numerous perfumes obtained from the fragrances derived from flowers, plants, seeds. They were blended into a cream made from animal fats and oils such as the expensive oil called balanos or the more common castor oil. The Ancient Egyptians also used myrrh, frankincense, cardamom and cinnamon to mix their perfumes.